The opening ceremony and ceremonial ribbon-cutting for the Poly Auction Macau Art Fair and Art Auction took place yesterday at the Regency Hotel in Taipa, formally launching the four-day cultural experience. The opening, co-organized by Poly Auction Macau Ltd. (Poly Macau) and Chiu Yeng Culture Ltd., was attended by former Chief Executive Edmund Ho, lawmaker Angela Leong, and Chiu Yeng Culture founder Sabrina Ho. The Poly Macau Art Fair project brings together 60 young artists from the Greater China region, whose works are installed in separate rooms at the Regency Hotel. Sabrina Ho, who personally oversaw the rooms’ design, sought to reinvent ordinary living areas and offer visitors a unique experience in each space. The Poly Macau Art Auction features both traditional masterpieces and contemporary artwork from across Asia, divided into a number of categories. The auction, which will take place on Sunday, January 10, presents connoisseurs with ancient artworks such as Buddhist art and Qing Dynasty ceramics. The preview for the auction began yesterday and will run until January 9, the day before the auction is held. At a media preview yesterday, the Times had the opportunity to scope out some of the works set for the auction on Sunday. 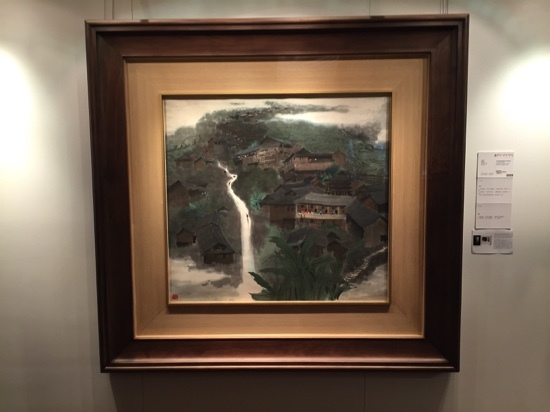 The highlights included a series of works by the late Chinese artist Wu Guanzhong, taken from a collection entitled, “Life and Death in Art.” Two of the pieces most prominently displayed in the auction hall are Wu’s “Yunnan Landscape” and “A Village in Guizhou,” with the former expected to fetch between HKD8.5 to 12 million if sold. The works comprise eight calligraphy masterpieces adorned with nonsensical characters, which are in fact a blend of traditional Chinese characters and Western words using the Latin alphabet.